Shaymin Cosplays | Ground and Air Form Hello everybody, it's Julia. Just before I start the post, I'd like to say that there has been some name changing, announcements of moving to Tumblr, and youtube channel things. To clear this up, I'd like to say a few things. I am not moving to Tumblr anymore, I decided to not change the name to J.J. Cosplay, and I may open a separate youtube channel or keep the cosplay videos on my own channel. Either way, I will let you know what's going on. Shaymin Cosplays So, JC and I are going to a convention in June, as you all know. We decided to do a cosplay together! You may have heard of the Pokemon, Shaymin. Well, Shaymin has a ground form and air form, so we decided to make a costume for both! I am doing the ground form, it resembles a hedgehog, and I'm making a dress out of it! I'm also making a costume for JC, it will be the Sky form and it will be more boyish, so not a dress. I'll be sure to keep you guys updated! Hey guys! The blogger's being a bit funky today, so sorry if this looks a bit odd. I recently asked JC if she would like to write a quick paragraph as an introduction. So, here it is! Take it away, JC! JC isn't a blogger, but she is an artist, and you can usually find her on her DeviantArt, youtube channel, and Discord chatroom server. Thanks for reading! Go check out JC and give her a few likes, at least! Keep cosplaying, Julia. Ouran High School Embroidered Badge + Instagram? Ouran High School Host Club Embroidered Badge + Instagram?Hey guys! 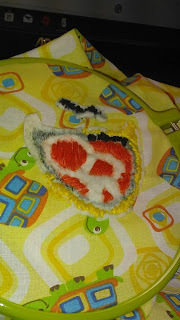 Today I simply wanted to show you a picture of the badge I am working on and explain how I am making it. Also, talk a bit about my return to Instagram! I am making my badge from a felt base, then embroidered on top of it to get the design correct. I used markers on the felt to get the basic shapes, tested it, then embroidered it. I still have to finish the black, fill in the white, and add some yellow. Ouran High School Host Club | Cosplay Panel I will be acting as Kyoya Ootori at a Sodak Con panel. Hello everybody! 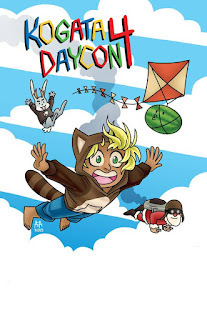 This summer, I will be going to my first Full-Three-Day Anime Convention! But, I will also be performing at my first cosplay (or any) panel! The panel is a QnA/Dares panel starring the cast of a great anime, Ouran High School Host Club! I will be acting as Kyoya Ootori. Wig Essentials and Guide In this video, you will see me demonstrate many essential steps for caring for your wig. Also, you can see me show you where I get my wigs at great prices! Any questions? comment on the video or here! How to Decide on a Cosplay | Advice Hello everybody, today I will be talking about how to decide on a cosplay. Deciding these things can be very hard, the wrong choice can be regretful. Look at your resources. Take a look at your fabric, wigs, and other supplies. What can you make NOW? Or what do you have ready? Yes, you can buy more supplies. But, if the convention is near. Or, if you're like me and spent all your money on the tickets. They can be expensive and hard to get. Take a look at the panels. Maybe you'd like to be part of a cosplay panel and you can make a costume for it. Or, there's a panel with voice actors from your favorite series you'd like to cosplay at. Consider all your options in this order before committing to anything. Kogata Daycon is a one-day convention. It includes anime, gaming (Tabletop and Video), and furries! This con isn't really new, but it's not as popular as it should be. I was very impressed with the quality of the management and professionalism. The whole con was overall enjoyable and fun! I even met the creator of Paper Jam. A part of an Undertale AU I'm not very familiar with, but she was very nice! I only went to one panel, the cosplay makeup panel, but I wish I would've gone to the fandom battle panel. (It was Harry Potter vs. Captian America. I hear it was hilarious!!) The makeup panel was super informational and helpful! I received help from the panel host, but I even received information from the attendees of the panel. The Cosplay Makeup Panel was held by Cure Elie or Cure Aphrodite Cosplay!